Los Pinos condos for sale were built in the late ’90s to take advantage of a proposed new lift. Today, they are located a half block from the base of that lift, now call the Snowflake, which carries skiers from this neighborhood up to the midway area of Peak 8, and gives access to all peaks of the Breckenridge Ski Resort. The skiing is easy, down Four O’clock or Snowflake runs, to return home to Los Pinos. All Los Pinos condos for sale are not the same. These homes come in a variety of sizes and configurations, from studios to three-bedroom. Most have a garage on the ground floor and living areas above giving them good views of either the ski mountains to the west or across the valley to Baldy Mountain. Find that perfect Los Pinos condominium by browsing listings below, or learn more about living in this idyllic community. 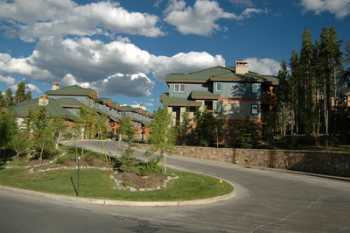 Located on Snowflake Drive Los Pinos, Breckenridge, CO, is steps from the shops and restaurants in Grand Timber Lodge, and one-half mile from downtown Breckenridge and very close access to the free town bus service. Geographically, they’re on the slopeside of the Blue River Valley and get early morning sun. There are various recreational opportunities offered to residents of Los Pinos, year round. Four O’clock Run is a path used in the summer by the neighborhood to access the national forest. Several trails radiate from this run and are open to hikers, bikers and equestrians. Once the snow starts falling, homeowners take advantage of the fact that they can ski to and from their Los Pinos condominium. Size (sq. ft. liv. area) : 268 to 1344 sq. ft. Amenities: in town, on free town bus, near the Snowflake Lift, most have garages. To find Los Pinos Townhomes: take 4 O’clock Road west from Park Avenue, turn left after .3 mile on Kings Crown Road, continue .2 mile to Snowflake Drive and turn right. After a very short distance, the next left turn is the parking area for the Los Pinos Condos. Ready to speak to a real estate professional from Breckenridge associates? Call us at (970) 453-2200, or email us now.